Giampiero Ventura said jokingly that he will manage Chelsea when Antonio Conte eventually departs. Ventura Managed the national team after Conte moved on to Chelsea in the Premier leagues. The pair who have shared similar career paths in the game, have often taken over from one another. 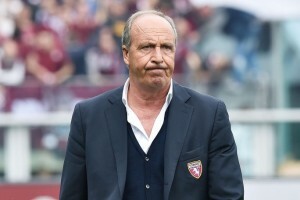 The 68 year old Ventura wants to replicate the success of Conte, as he had when he managed Bari after Conte guided them to a victory in the Serie B.
Ventura thinks that Conte is a “good luck charm” and is looking forward to doing great things with the team. He said that he is preparing to take over and is already working on improving his English skills. Ventura said jokingly, that he “…got in touch with Conte three minutes ago. He had then asked him, ‘how are you’, and he said, ‘fine’. His English is perfect now,”. Ventura will start off his era as the coach of the Italian team, after the UEFA Euro 2016 on 18 July 2017. His team will be playing against France this week, after which the team will face Israel in a World cup qualifier a few days later. The new coach has a 2 year contract with the Italian Football Federation. Ventura said that in his conversation with Conte before he signed on with Chelsea, Conte had wished him the best of luck, which he thought was very kind.